Ready to Try an Elimination Diet? we are not a fan of being overly restricted with the foods we eat. In fact, much of our work focuses on ‘undoing’ years of chronic dieting mentality. So to post an article about restriction has me a little uneasy. Nonetheless, there are some situations in which a short term food restriction can help problem solve what foods may be causing more harm than good. The elimination diet is not about cutting calories and losing weight. Instead, the goal of the elimination diet is to pinpoint foods that we might be sensitive or allergic to. In fact, it’s the gold standard in identifying what you are sensitive to. An elimination diet involves removing foods from our diet that we suspect our body can’t tolerate well. The foods are later reintroduced, one at a time, while we look for symptoms that show a negative reaction. It should only last 2-3 weeks (possibly more) and works to alleviate symptoms like bloating, gas, diarrhea, constipation, and nausea. Once we’ve successfully identified a food our body can’t tolerate well, we can remove it from our diet to prevent any uncomfortable symptoms in the future. We recommend working with a nutritionist or functional medicine doctor through this process. Adrenal and thyroid issues are extremely common in our fast-paced lives. These issues usually creep up because the body has been chronically stressed. This stress can come from emotional/psychological stress (think traumatic childhood, living with an abusive partner, hating your job/boss, overloading your schedule) and it can also come from physical stress (not exercising enough, exercising too much), and finally internal stress (chronic infections, illnesses, gut microbiome dysbiosis, insulin resistance, food sensitivities, etc). So by doing the elimination diet, one can rule out any food intolerances they might have and begin fixing any imbalances in the gut. We have seen a surprising number of clients experiencing leaky gut, food sensitivities, and chronic inflammation – so it would be no surprise if you found something going on with you as well. To start, we recommenced observing how you feel after eating certain foods, especially those that are known to be inflammatory foods. Then, after consulting with your doctor, you can officially start the elimination diet the following week. That way you can ease into it without the pressure to be perfect. We could do a food allergy and sensitivity test, but a cheaper, more effective way to determine what foods are causing leaky gut and thus inflammation, is by removing the top inflammatory foods for 10 days and then reintroduce them one by one to see if you have a negative reaction to them (it’s very effective and often results in people removing these foods for a lifetime). If you end up needing an more comprehensive food sensitivity test, I included the leading brands that offer testing towards the bottom of the article. The food diary is a powerful tool to bring awareness to your eating patterns. Testing yourself to see the effect different foods have on your energy levels and mood will allow you to start understanding your body’s relationship with specific foods. By determining how your body reacts to certain foods will help you to see the relationship between what you eat, what’s the physiological reaction, and how it makes you feel. “Physical symptoms are bodily sensations. Emotional symptoms may be a little harder to notice. According to fertility coach Sarah Clark, “many people expect that when they go on an elimination diet, they will instantly feel better. Some do, but some do not. Here’s the thing, if you’ve regularly been consuming reactive foods and eliminate them cold-turkey, you can experience withdrawal symptoms. Essentially, your body has adapted to this regular onslaught of inflammation and either up-regulated or down-regulated certain pathways to help clear out problematic food antigens and other inflammatory mediators. When you remove the trigger, it takes time for those mechanisms to find a new equilibrium. It’s somewhat akin to an alcoholic going through withdrawal when they enter rehab, though usually less severe symptom-wise. Sometimes this period of adjustment can last for two weeks, leaving you to scratch your head over why you’re fatigued, experiencing headaches, or having strange bowel movements. Unfortunately, if you are not aware of this, you may assume that the foods included in your elimination diet are causing your symptoms to get worse. This can lead you to eliminate even more foods from your diet – and they may very well be the foods your body needs to heal. If you continue to feel this way, though. We may need to do a food sensitivity test to dial in what foods are reactive to YOU. And remember! Just because eliminating a food at one time helped you heal doesn’t mean it’ll stay that way forever. Our bodies are constantly changing, life is constantly changing, our stress levels are constantly changing, so to assume that a food may be off limits forever is nonsensical. Note: The reintroduction of colorings, additives, preservatives, artificial sweeteners and GMO’s is not recommended. It is also recommended to keep alcohol, gluten and dairy on a limited intake as these are know inflammatory foods. After 10 days it is recommended to re-introduce the foods that were removed from the diet. Reintroduce one food at a time into the diet by ingesting two servings – one serving for breakfast and one serving for lunch starting on day eleven, so that by the end of the day at least a typical amount of the food has been eaten. Use a food diary (see above) to record the results over the course of three days. If you don’t experience any symptoms you might be able to keep that food in your regular diet without an issue. You’ll want to follow the lead of your doctor here. If you experience any symptoms as you re-introduce the food, it’s recommended to stop eating the food, wait three days and then continue to re-introduce the remaining foods. A new food is introduced (or tested) every three days and you will record the results again for each one before introducing the next food. Oftentimes, people have said they had “no issues” with a particular food only to find out after further questioning that symptoms did show up. Cheese seems to be the #1 food that falls into the “I feel fine, except for a little stuffiness and maybe some constipation” category. These are symptoms and should be considered a food reaction worth noting. Still having symptoms of bloating, gas, constipation, diarrhea, etc? You may need to invest in a comprehensive food sensitivity and stool test to check for sneaky foods that are still causing inflammation or perhaps parasites, pathogens, and bacteria that are overgrowing and causing undo stress. 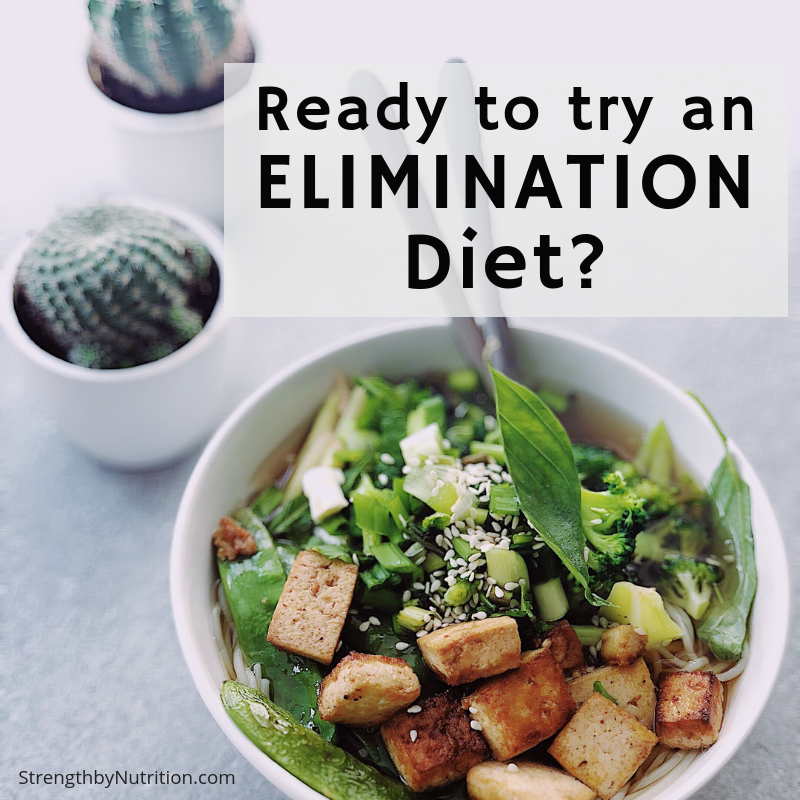 I hope this gives you some insight on what an elimination diet consists of and if you may need to try one. Of course, we recommend always working with a nutritionist or dietitian when making drastic changes like this and perhaps hiring a nutrition coach to guide you through the process. Good luck and we hope you feel better!